April 20, 2012 in category Misc Silliness tags Advertising characters, Cool dudes, Skateboard Characters, Spanish packaging and 0 comments. 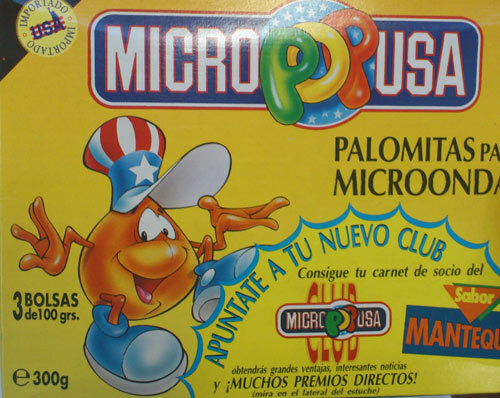 This Spanish microwavable popcorn boasts that it is ‘Imported from USA’ and if you join their membership club there are ‘lots of prizes’ and ‘interesting news’. We have a plump baseball cap and huge trainers but no skateboard. If his shoes had tongues and laces and his cap was tilted he qualify as cool. He definitely displays gang related hand signals but has no ‘tude. I like the art. Maybe the hands could be floating and not attached by those skimpy, breakable arms. But it’s well drawn and dynamic. His face is definitely trying to convey some kind of message from the artist. His eyes look jaded as if he’s tired from posing and would rather be doing something less embarrassing. Not cool. The desperate attempts to be ‘American’ are unsettling. This packaging is a fine example of how a good design can be ruined at the last minute. I presume the same artist/designer/design company made the character and logo but then the wife of the of the owner of the pop orn company got her hands on it and added that awful flash etc. It would work much better if they went all out and used the stars and stripes for the background instead of that yellow.